IT IS REMARKABLE how many Republicans and conservatives deplore the liberty-infringing perils of big government, yet applaud Arizona's draconian new immigration law, which empowers the police to interrogate anyone suspected of being in the country unlawfully. It is also perplexing. How can they brandish "Don't Tread On Me" signs at a Tea Party rally on Monday, then on Tuesday cheer a law making the failure to carry "an alien-registration document" a crime? Surely Americans who extol the work ethic and admire the spirit of enterprise should be dismayed -- not delighted -- when Arizona forbids a willing employer from hiring a willing employee because of something as irrelevant as his immigration status? Not all Republicans endorse the new statute. US Senate candidate Marco Rubio has spoken out against it in Florida; so has business executive Meg Whitman, now running for governor in California. Other GOP critics include Texas Governor Rick Perry, political strategist Karl Rove, and South Carolina Senator Lindsey Graham. But they are decidedly in the minority. According to the latest Gallup poll, 75 percent of Republicans who have heard of the new law support it; only 17 percent are opposed. I have never understood the anti-immigration hysterics. Industrious self-starters who come to the United States to find work, create new wealth, and improve their lives are not a menace or a threat. They are an asset. No state seeks to drive out hard-working newcomers from New Mexico or Indiana; why should hard-working newcomers from Old Mexico or India be treated any differently? To say that they cross the border illegally only begs the question. Why should it be illegal for any person to come to the United States, assuming his intentions are peaceful and he is not likely to become a public charge or health risk? For most of US history, there was no ceiling on the number of immigrants allowed to enter the country. There were some specific exclusions -- polygamists and prostitutes were denied entry, for example, and the racist Chinese Exclusion Act barred immigrants from China -- but on the whole, nearly anyone who wished to settle in the United States before the 1920s was free to do so. The immense influx of immigrants made possible by that policy was often the cause of tension and suspicion. It was also an extraordinary blessing, transforming America into the most prosperous, vibrant, and innovative nation in history. We have an illegal immigration problem today only because federal law makes legal immigration so costly and difficult. A concrete-and-barbed-wire wall along the border will not fix that problem, and neither will punitive sanctions on employers who hire illegal aliens. Meaningful immigration reform would focus instead on simply making it easier for low-skilled or unskilled workers to enter the country lawfully. Rosa Parks after being arrested in 1955. What part of 'illegal' did she not understand? Republicans like to think of themselves as champions of law and order -- never more so, many of them, than when damning illegal aliens. To quote Republican state senator Russell Pearce, lead sponsor of the new Arizona law: "Illegal is illegal." That is what passes for a thoughtful argument among many immigration restrictionists. But there is nothing thoughtful or admirable about insisting that a foolish or counterproductive law be enforced at all costs. 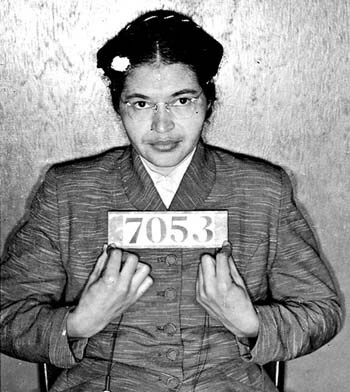 In Montgomery, Ala., in 1955, Rosa Parks broke the law that mandated racial segregation on public buses. For refusing to give up her seat to a white passenger, Parks was arrested, fingerprinted, and fined. As she was being removed from the bus, she asked the arresting officer, "Why do you push us around?" "I don't know," he replied. "But the law is the law and you're under arrest." A century earlier, thousands of Southern slaves were guided to freedom by "conductors" along the Underground Railroad, the clandestine network of escape routes into the Northern states and Canada. Those "conductors" -- many of them supporters of the new Republican Party -- loathed the Fugitive Slave Act, which mandated the return of runaway slaves and imposed criminal sanctions on anyone aiding a fugitive. No doubt there were Americans who cried then, as Russell Pearce and those who anathematize illegal aliens cry today, that "illegal is illegal" and the law must be obeyed. Of course respect for the law is important. But when laws are foolish, perverse, and repugnant to American interests and ideals, they should be resisted and replaced. Republicans and conservatives should be leading the fight for real immigration reform. How sad that so many of them would rather fight immigrants instead.